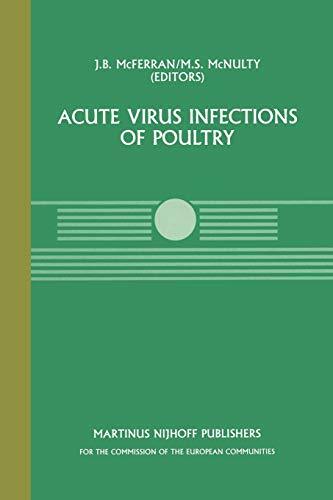 This book is based on the proceedings of a seminar on acute viral in­ fections of poultry, which was held in Brussels on 13-14 June 1985. The aim of the seminar, which was sponsored by the CEC, was to gather infor­ mation on those infections of immediate or increasing importance. It is hoped that dissemination of this information will make it easier to har­ monize diagnostic and control measures throughout the member states of the EEC. Several points emerge from recent outbreaks of highly pathogenic avian influenza. In view of the apparent change in pathogenicity of the virus involved in the outbreak in the USA, infections of domestic poultry, particularly with H5 and H7 sub-types, should be regarded as a potential threat, even if the viruses involved are of low pathogenicity. The reasons for the amount of lateral spread which occurred in the USA outbreak are still not clear, and it can not be assumed that future outbreaks of highly pathogenic avian influenza will tend to be self-limiting, as in the past. The importance of denying access of wild birds, particularly water fowl, to domestic poultry needs to be re-emphasised. Lastly, there appears to be increasing support for a combination of slaughter and ring vaccination to control future outbreaks of spreading avian influenza.